This book's principal theme is the taxation of permanent establishments, taking as its starting point the OECD (Organisation for Economic Co-operation and Development) model convention on the avoidance of double taxation, and examining how the Indian courts and India's law-makers have interpreted the rules governing attribution of profits. The dramatic advances in communications and technology that have taken place in recent years, combined with the progressive development of the Indian economy, have enticed many multi-national companies to tap the rich resources which India has to offer in terms of front-line business support services and customer relations. This has thrust the Indian tax system into the limelight, with multi-nationals and their advisers now needing to become familiar with the relevant aspects of Indian tax law and practice, and in particular, how India approaches the concept of permanent establishment and the circumstances in which a liability to tax in India could arise. 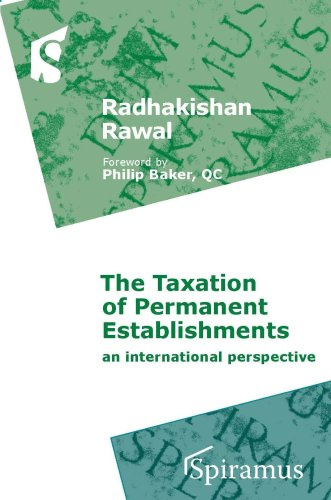 This book's principal theme is the taxation of permanent establishments, taking as its starting point the OECD (Organisation for Economic Co-operation and Development) model convention on the avoidance of double taxation, and examining how the Indian courts and India's law-makers have interpreted the rules governing attribution of profits. Some of the issues and concepts may appear to be well settled and some are new.